Hindsight is 20/20. Isn’t that what they say? It’s really the truth. 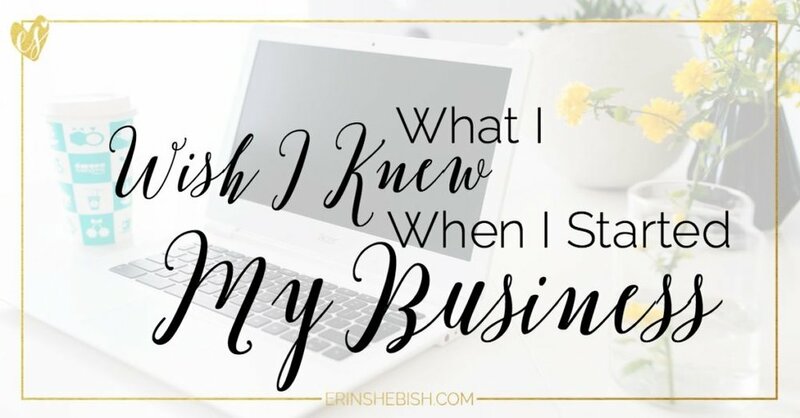 I often look back at times of my life and think “If only I knew then what I know now.” That includes my business and blog. And since I'm feeling a little sentimental, sappy even, I had to tell you exactly what I wish I knew back then. Running a business from home is hard work. I know… I thought it would be easy. I’d work when I want and that would be that. But that’s not how it goes. You work any chance you get and some days there just isn’t enough time! And on the days that you do have time, there's ample work to be done. If you're just starting out, you're the one creating content. Marketing. Taking photos. Handling social media. Taking care of customers/clients. There literally is no end to the work that needs done. Schedules are imperative to success. If you’re not using a schedule for yourself, or at least some semblance of one, you’re probably over doing it. I know what I said in my first point. Work when you can. But truthfully, you do need to set aside some time to work out some form of routine. Even if it's just designated days that you'll work on designated projects. Not having a schedule of sorts does typically lead to overworking and burnout. And if not that, falling behind and then feeling poopy about it. I say this from experience. Your patience will be tried. I don’t care how nice you are… how saintly you are. There will come a time when you will have to walk away and breath. There will be days when you have no idea how to respond to this or that without losing your cool. Because sometimes there are situations that are challenging. Working with others has the potential to be challenging. You'll get comments that will make you tip your head and wonder why they aren't following the age old advice of "if you have nothing nice to say, say nothing at all." But you’ll learn to handle it well. Instead of flying off the handle, you’ll learn your limits. You’ll learn how to handle touchy situations and tricky clients. You may get irked now and again but you won’t want to yell and cry. Much. Instead, you'll handle challenging situations with grace, poise and possibly a little wine. Work will stop feeling like work. You’ll love what you’re doing so much that there are times that you forget that you're on a schedule and you’ll just want to keep at it all day. And yes… there will be times when you forget to grab lunch because you’re so deep in it. Piece of advice? Don't forget that lunch. Or coffee. Both are pretty darn important to your well being. Okay, maybe not the coffee but I'm a firm believer that coffee is good for your soul. Sure it’s fun to be a jack or jill of all trades but the real joy kicks in when you hone in on a skill, refine it and earn yourself an “expert” title. When people start coming to you for something specific because they know you can deliver something with character and quality, you know you’ve fine tuned yourself to that point of expertise! Plus it totally boosts your authority when you really hone in on something. And you want authority in your field. Sure. You can try to go it alone. But when you’re working as an online entrepreneur, finding community can be the best thing for you. You’ll have people that understand that things that you’re working through and people to give you ideas and opinions. You’ll make friends… sometimes those friends end up being your best friends! And that’s an amazing thing! There are so many fabulous places to find community too! If you're struggling with finding you tribe, be sure to join my free group, The Creatives Nest. We'd love to have you! There is nothing you’d rather do more. Despite all of the ups and downs, there is nothing you’d rather do than your job. It brings you joy, satisfaction and a sense of pride. Talk about finding your calling. So, what have you learned during your time as an online entrepreneur? Leave me a comment, I'd love to hear from you!